Open The Easter Bible Storybook to meet Mary in a garden, Peter and John,friends out walking and, most of all, Jesus! The Easter Bible Storybook is a truly delightful retelling of the Easter story, especially for under 5s. It features full-colour photographic spreads of the much loved Bible Friends characters from the award winning Big Bible Storybook. The Easter Bible Storybook Pack of 10 by Maggie Barfield was published by Eden bundles in March 2016 and is our 2320th best seller. The ISBN for The Easter Bible Storybook Pack of 10 is EDENBUNDLE-1730. Be the first to review The Easter Bible Storybook Pack of 10! Got a question? No problem! 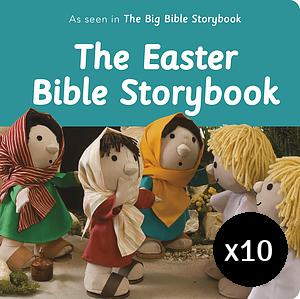 Just click here to ask us about The Easter Bible Storybook Pack of 10.